People talk about making all sorts of things, but I've not heard many people talk about making tofu. After interviewing Marco, I'm left wondering why! It seems pretty straightforward, the process leaves the maker with a bonus byproduct, it's much cheaper than buying it, and it retains a flavour, which is lost with the mass produced stuff! Or have I got it all wrong and am I just unaware of the many who make their own tofu? 1.) If you make your own tofu, how do you make it? 2.) If you haven't before, would you want to give it a go and make some at home? For now, over to Marco who will tell you everything you need to know about The Tofu Box, plus a little bit more! What does The Tofu Box specialise in selling? 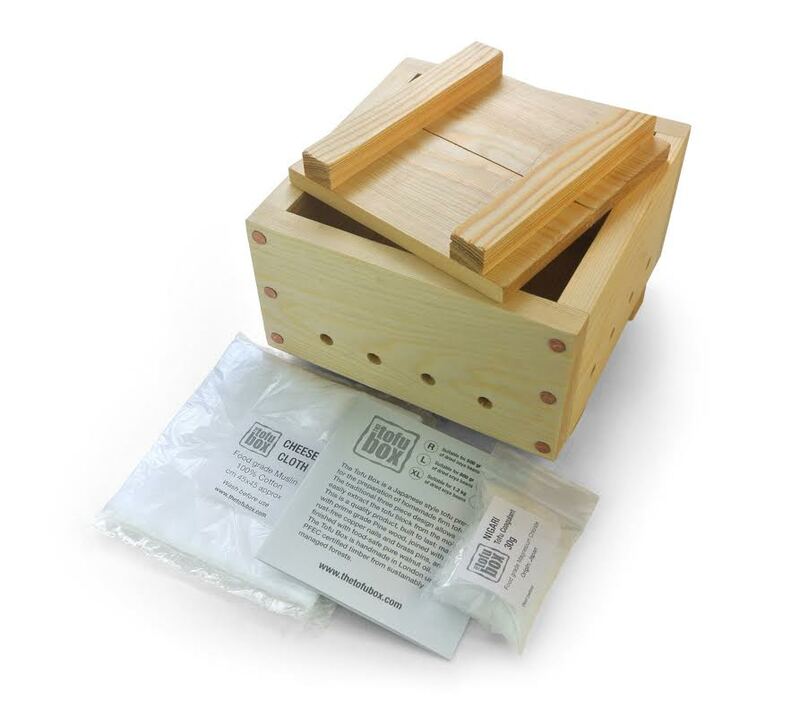 The Tofu Box specialises in quality hand-crafted wooden kits that are designed to make tofu. Where is The Tofu Box based? The Tofu Box is based in London, which is where I live. I build the kits in my workshop there. I sell mainly through online market places as eBay, Amazon, Etsy, Folsky and Dawanda. This allows me to reach every tofu-lover in every corner of the world. The furthest place that I've sent a delivery so far, is New Caledonia! To buy a tofu kit simply visit my website where you will find the links to your favourite online market place. You can also buy directly from me if you use the contact form. The benefit of this is that you will receive a 10% discount, because there's no “middle-man.” I express my gratitude by passing the savings to you. What inspired you to create a business that solely focuses on kits to make tofu at home? I love wood crafting and I love cooking. On my journey as a vegan, I developed a passion for tofu and I discovered how easy it is to make it at home. I realised that the tofu kits available on the market were mostly imported, often mass-produced and of poor quality. In my mind, whoever wanted to make tofu at home deserved better than that! So I decided to develop a solid, long lasting, hand made tool for the brave tofu-maker. When I build a tofu box, I make it for “you” rather than for “the market”, and I like to think that, somehow, this reflects on the product. How easy is it for you to source ethical parts for your products? It is fairly easy in London. I use prime grade European pine wood PEFC certified (timber from sustainably managed forests) and I use locally sources walnut oil to finish the product. Along with your product, what would the user need to make the tofu? The customer just needs soya beans, which can be bought from local health food shops, some supermarkets or online. I like to use fair-trade, organic soya beans. Why should one bother to make tofu when it's so readily available in supermarkets? You can’t possibly experience the true taste of tofu with an industrial product. Fresh home-made tofu has a fragrant, slightly sweet and nutty flavour that persists for only 2-3 days. of course tofu can be kept for a week in the fridge, and it can be frozen, but you can’t taste what I described in the preserved store-bought tofu. Also, home-made tofu costs a fraction compared to the commercial product. So if you love tofu you can make some serious savings. And let’s not forget that home-made tofu gives you okara too, which is a precious by-product. Okara is soy pulp. It is the by-product of turning soy beans into soy milk when making tofu. It's a good source of fibre, minerals and proteins. You can use it as an ingredient when baking, making burgers or you can dry it in the oven and sprinkle it in your breakfast bowl. You can find more inspiration on the recipes that have been posted on my website. Is it possible to use the kits to make anything else? The tofu box can also be used for pressing store-bought tofu to obtain pressed tofu (when you are in hurry and don’t feel like making it from scratch). It can also be used wherever a food-press is needed, for example I use it to form my meatless loaves and cashew cheese. Is The Tofu Box owned by, or in partnership with, another company that tests on animals or sells non-vegan products? No, this is a one-man company. I am the owner, director, worker and seller. After my studies in arts and crafts, I had a few jobs, one of which was a cook, and another was wood-crafting. I’ve always maintained an interest in food and nutrition, but I became more passionate about it when I began my journey to adopting a vegan diet. As a crafter I enjoy making useful tools that people can use to make other things (or food). What is your vision for the future of The Tofu Box? The Tofu Box will remain mainly an online store, and it will develop into a one-stop shop that offers all you need for your home-made tofu, including accessories, ingredients and spices for speciality tofu. The tofu kits will remain hand-made products, as I’m confident that I can manage an increase in orders without compromising that aspect of my business. No matter what, I want to maintain a direct relationship with my customers and I want to provide that human touch to the product. If you fancy using The Tofu Box to make your own tofu that's full of flavour, place your order via this contact form and save 10% discount.